The Marble Arch Caves Global Geopark in Co. Fermanagh is well known for one of the finest show caves in Europe, but did you know there is more to this location than the caves?! 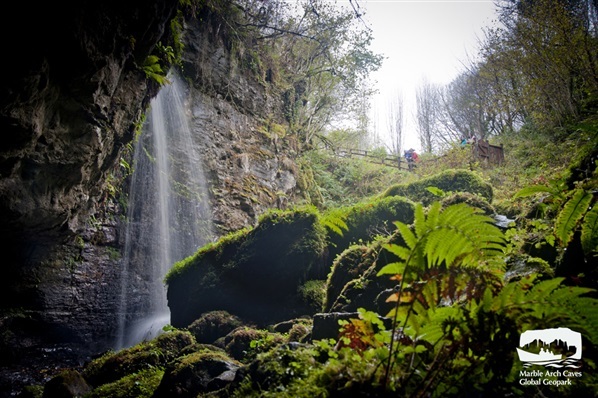 The Marble Arch Caves Global Geopark contains some of the finest landscapes in the north of Ireland with wonderful walkins in Fermanagh and Cavan ranging from rugged uplands, lakes and forests through to gently rolling drumlins. The landscapes represent a complex earth history dating back as far as 895 million years ago and can be explored on foot. 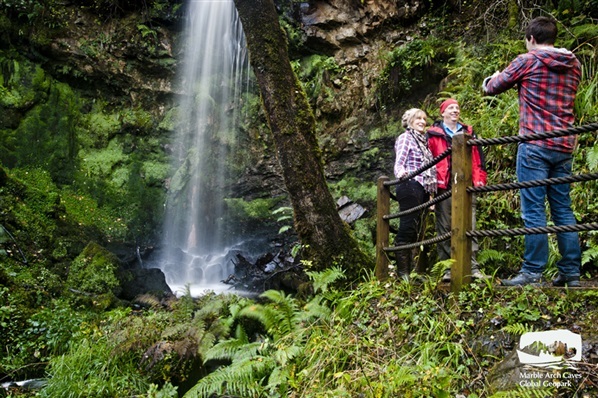 Here are some of our must visit walks in the Co. Fermanagh region of the Geopark. 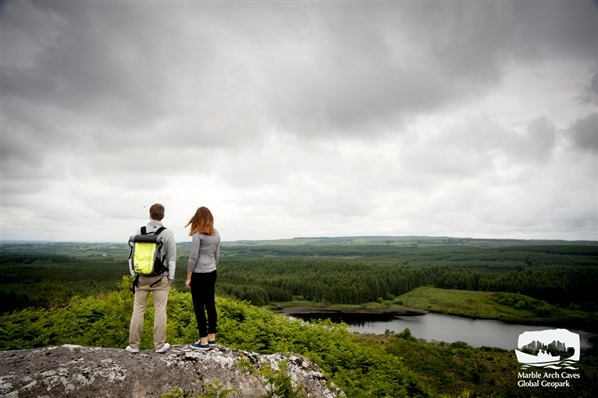 This walk is located in the Boho-Belmore Mountain area, right in the heart of Fermanagh’s cave country. Beneath your feet lies an extensive maze of caves which attract cavers and potholers from far and wide to west Fermanagh. The most extraordinary feature on this route is Pollnagollum Cave, Irish for "Hole of the doves". The cave is fed by a waterfall toppling down from the top of a limstone cliff and is swollen to a torrent during harsh weather. Depending on the time of day and year keep a watchful eye out for bats and birds around the cave entrance. 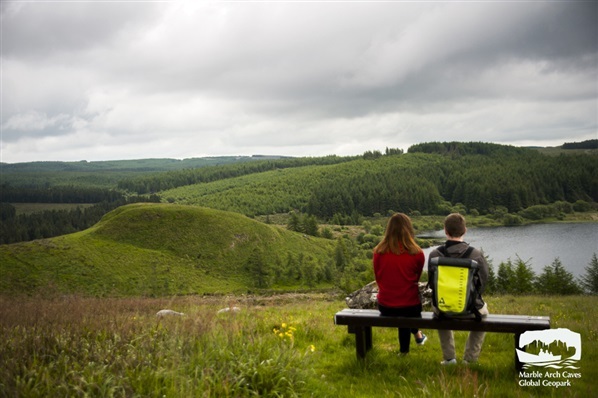 Cloaked largely with conifers, this beautiful short walk allows you to explore some of Fermanagh’s best upland landscapes. The forest is inhabited by wildlife as varied as red deer, herons and dragonflies. 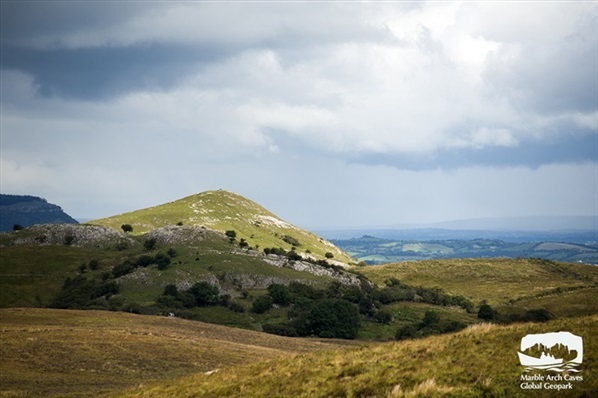 One of the highlights of this walk is the short but rewarding climb to the summit of Little Dog where you will be rewarded with 360 degree panoramic views of the surrounding area. 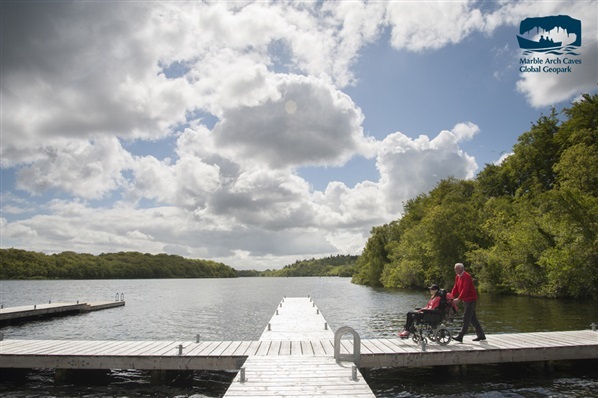 Located on the eastern shores of Lower Lough Erne, this walk takes in many differing landscapes and offers something for everyone. The magestic Tom's Island boasts great views across the lough to White Island and Davy's Island. This trail also skirts around the shoreline offering a quite place for reflection. The forest is a richly varied one and features ruined Castles, WWII docks & buildings as well as ancient woodland. Be sure to pack a picnic and enjoy the panoramic views. Spectacular views await those who explore Castle Caldwell Forest. 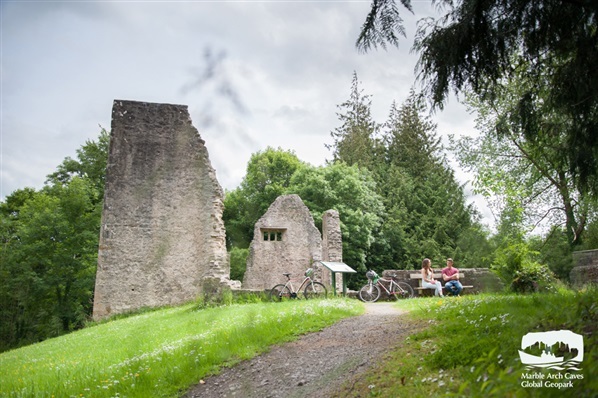 One of three routes this walk follows the lake and shore and takes in man-made and natural wonders, including a lime-kiln which hints at the association of the Caldwell estate with the nearby Belleek Pottery and the eerie ruins of Castle Caldwell. Sweeping up from the shores of Lower Lough Erne, one of the largest freshwater lakes in Ireland. Ely Lodge Forest is important nationally for its broadleaf woodland and biodiversity. Taking its name from the nearby Ely Lodge, one of two gate lodges that would have adorned the gates of the demesne of the Marquis of Ely, Nicholas Loftus, the Estate was the largest in Co. Fermagh during Victorian times. One of three routes in the forest, the blue waymarked route will take you on a path through a wooded landscape to Carrickreagh Jetty where on a calm day the mirror reflections on the lough are breathtaking. The summit of Gortmaconnell Rock can be reached by a short but rewarding climb contouring around the hill. 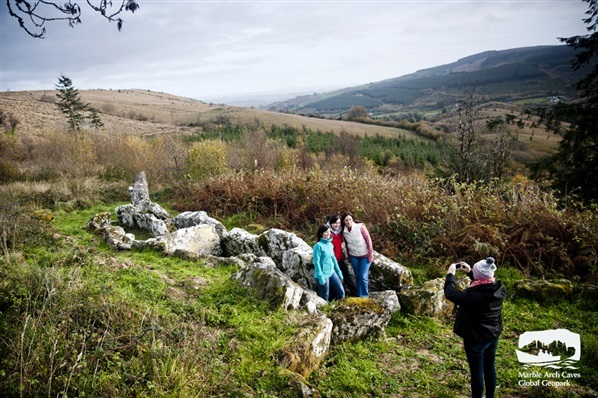 The viewpoint offers wonderful 360 degree panoramic views of Cuilcagh Mountain, MacNean Valley and the Erne Lowlands. From here you can also see the Owenbrean River, which flows down from Cuilcagh Mountain before sinking underground, eventually reaching the Marble Arch Caves system. Lough Navar Forest is undoubtedly one of the jewels in the Marble Arch Caves Global Geopark. 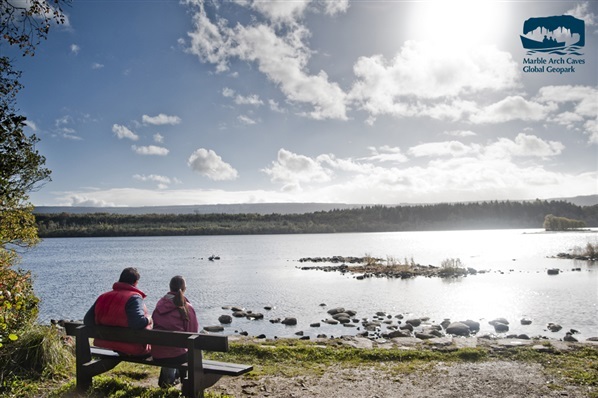 With 4 routes to choose from this walk along forest roads makes its way through the oldest part of Lough Navar Forest leading to the Blackslee Waterfall, where water cascades over a 20 metre cliff before continuing its journey down an undercut rocky gorge. One of the largest sections of continuous forestry tracks in Northern Ireland, this forest is steeped in geology, local myths & wildlife; so there is something for everyone. The walk passes a classic Dual Court Tomb from the Neolithic period, an elevated site amongst the conifers, it was constructed when there were fewer surrounding trees, allowing for spectacular views across the area. 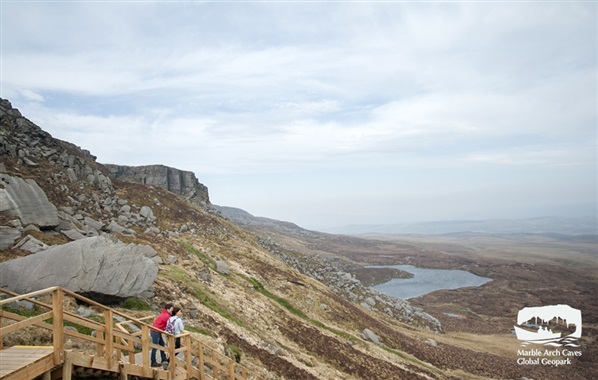 As you walk, keep a look out for upland birds such as merlin and hen harrier, have a rest at the Brimstone Rock and take in stunning views of nearby Cuilcagh Mountain. This brisk walk is a chance to fill your lungs with mountain forest air while enjoying the views from the summit of Formal More. The route is almost all on forestry tracks with a short path through the heather. Spend some time taking in the views which include features of geological interest, you may be surprised at how much wildlife comes to you in this seemingly barren woodland. The most intriguing feature in the forest is Lough Formal, sitting at 240 metres above sea level this small mountain lake sits astride a fault (or crack) in the Earth`s crust.